A search and rescue task force patrols a flooded region by boat over a fully submerged road in the aftermath of Hurricane Florence in Castle Hayne, North Carolina, Sept. 17, 2018. Tropical depression Florence dumped heavy rains across a swath of the southeastern U.S. on Monday, leading to new worries about vast flooding from a storm that has already killed at least 17 people. The National Hurricane Center said the storm now only has maximum sustained winds of 35 kilometers an hour, but authorities voiced new concerns about rising floodwaters and fears about breached dams and landslides. The government agency said the storm would weaken further "before re-intensifying as it transitions to an extra-tropical cyclone Tuesday and Wednesday." 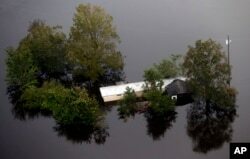 Floodwaters surround a trailer in the aftermath of Hurricane Florence in Pollocksville, N.C., Sept. 17, 2018. The National Weather Service predicted "heavy and excessive rainfall over the next couple days." Meantime, the weather agency said there was an "elevated risk for landslides" in the mountainous regions of western North Carolina and southwestern Virginia, along with "catastrophic and life-threatening flash flooding" in parts of North Carolina and South Carolina. Brock Long, the administrator of the Federal Emergency Management Agency, told Fox News, "Unfortunately, we've still got several days to go." In another interview, he told CBS, "People fail to heed warnings and get out or they get into the floodwaters trying to escape their home. And that's where you start to see deaths escalate." 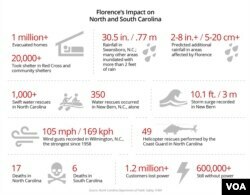 "Even though hurricanes are categorized by wind," Long said, "it's the water that really causes the most loss of life." North Carolina Governor Roy Cooper says the risk to life is "rising with the angry waters" as what is left of Hurricane Florence dumps hour after hour of rain on the state. "Wherever you live in North Carolina, be alert for sudden flash floods. Pay attention to the weather warnings and be ready to head for safer ground if you're asked to evacuate," Cooper warned residents during a Sunday news conference. 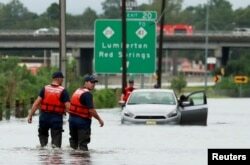 Some parts of North Carolina have already received about 100 centimeters of rain, while totals of about 50 centimeters have been reported across wider areas. Forecasters expect five to 12 centimeters of rain to fall as the storm moves from the Carolinas up into southern New England in the coming days. All of that rain is swelling streams and rivers and creating what the National Hurricane Center called "prolonged significant river flooding." Entire towns and cities are completely cut off by floodwaters. Major highways are covered and more than 700,000 homes have no power. Members of the Coast Guard help a stranded motorist in the flood waters caused by Hurricane Florence in Lumberton, North Carolina, Sept. 16, 2018. FEMA chief Long told Fox News Sunday, "This is going to be a long, frustrating event" for those who have lost their homes or face substantial damage when they eventually are able to return. One of the hardest hit cities in North Carolina was New Bern, a riverfront city not far from the coast. Mayor Dana Outlaw said the city, hit by a three-meter storm surge at the height of the storm on Friday, has 4,200 damaged homes. Across North Carolina, 26,000 people were being housed in 157 shelters after escaping their homes in advance of the flood waters. The White House said President Donald Trump would visit the storm-ravaged region in the coming days, but only after it is determined his arrival would not disrupt continuing rescue and recovery efforts.